robotics-university.com | Hello, how about today? I hope you always in good condition. 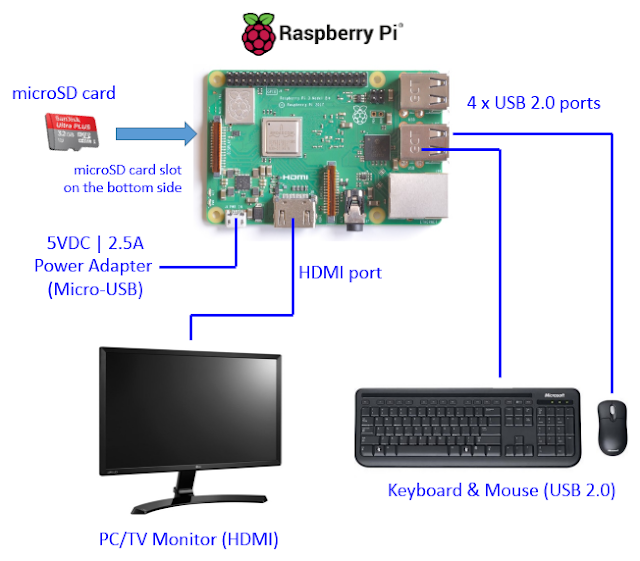 Today I will give you a guide how to install Raspberry Pi support devices (LCD/LED monitor, keyboard, mouse, and micro-SD card) on your Raspberry Pi hardware. Like in general computer, Raspberry Pi minimally need equipped with some other device that can make us enjoy work with it. Raspberry Pi need to connect with a monitor to display all of its activities. Need to connect with keyboard to make us can write an email, text documents, and also programming. Need to connect with mouse to make us possible to control the pointer or cursor that very helpful when we work using it. From the figure 1, in order we can see all of our activities with Raspberry Pi, we must connect Raspberry Pi with a LED/LCD monitor via each HDMI port. Then in order we can write python code to set Raspberry Pi GPIO when we build embedded LINUX system, we must connect a wire/wireless USB keyboard on the one of the four available USB 2.0 port there. And then, to make us easier when control the moving of mouse pointer/cursor, we should using a wire/wireless USB mouse. Connect the USB mouse on the one of the three USB 2.0 port left. To store the LINUX operating systems files and data storage, we need an installed micro-SD card on Raspberry Pi, so we must place a micro-SD card on its slot on Raspberry Pi board. The last but it is important. To make Raspberry Pi working, we must connect it power supply. Don’t be wrong about the electricity voltage and the current that must supplied for Raspberry Pi. Raspberry Pi just need maximum 5 VDC voltage and 2.5 Ampere current. For the voltage, don’t be more or less from 5 VDC. If the voltage higher from 5 VDC, it will make Raspberry Pi burned and if it less than 5 VDC, it will make Raspberry Pi not working. For the electricity current, we can supplied Raspberry Pi with minimal 2.1 Ampere, but if less than 2.1 Ampere, Raspberry Pi will not working. 0 Comment For "Raspberry Pi Hardware Installation"